The day that hockey fans have been waiting for all offseason is here. A summer of anticipation is over and the start of the NHL season is only hours away. The Bruins will open their season in Washington against the Capitals tonight at 7:30 and watch them raise their championship banner. 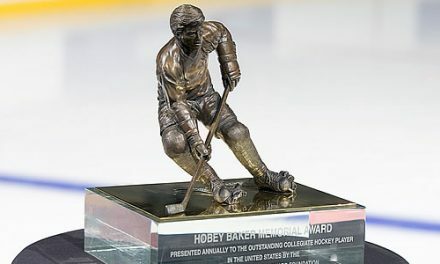 This will only motivate a young Bruins team with championship aspirations. It will not be easy as their division only got stronger with Toronto’s addition of John Tavares. 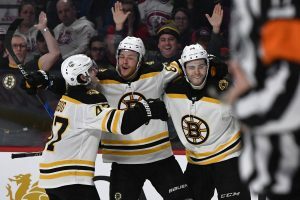 The Bruins still have enough talent, and like last year will be looking to surpass expectations. Last year, the Bruins finished second in the Eastern Conference after a magical regular season. They will again be bolstered by one of the best lines hockey and a young core that is just beginning to emerge. Jake DeBrusk and Charlie McAvoy showed last season that they can be above average players for years to come. This season they will be joined by highly touted rookie Ryan Donato and Anders Bjork who battled injuries last season. How well these young players perform will dictate how far this team goes. They will be looking to build on last season and for this group a playoff appearance will not be enough. Last season the Bruins Stanley Cup core from 2011 showed that they still have a lot left in the tank. 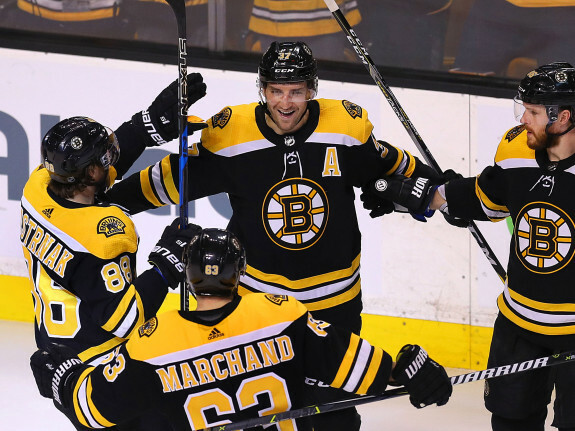 Patrice Bergeron will again center the Bruins’ top line which will only be better this season. Marchand continued to dominate and, when healthy, averaged more than a point per game. They meshed quickly with the Bruins’ young forwards, which was a pleasant surprise. They were carried by their youth and this season will be no different. Their rookies had the most goals in the NHL last season, scoring over fifty. Ryan Donato contributed to that, and will be looking to build on his brief NHL debut. 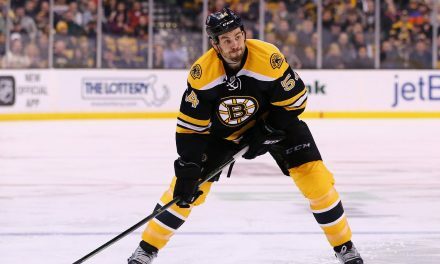 He will be joined by Urho Vaakanien, who will get opportunities with the injury to Torey Krug. 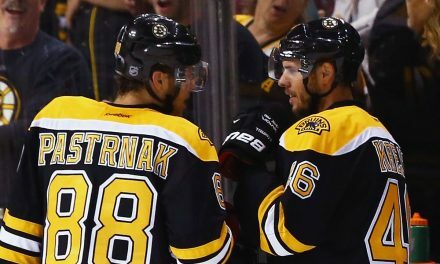 They will be looking to make the same type of impact that Charlie McAvoy and DeBrusk did last season. Furthermore, the Bruins have a solid defensive unit in front of starter Tuukka Rask. Chara will again anchor the group alongside McAvoy who already is one of the NHL’s top defenseman. The only new addition to this group is John Moore, whom the Bruins signed to a five-year deal in free agency. Last year this group struggled at times, but will improve this season as McAvoy and Matt Grzelcyk get more experience. They will also see the return of Brandon Carlo, who missed the playoffs last year due to injury. This group has the potential to be one of the best defensive groups in the NHL, and tonight will be their first major test. 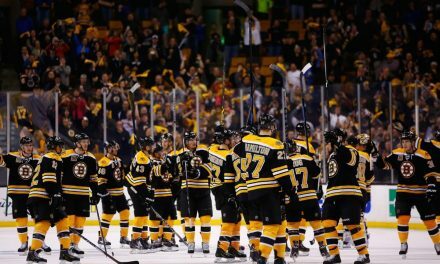 The Bruins will again be a playoff team this season. Despite their youth, they have one of the deepest roster in the NHL. Their mix of veterans and youth should only continue to improve even with new faces added to the mix. Starting off against the defending champs will be a good test for this team. It will give the Bruins a chance to see how well their new line combinations work together. They will be looking to end a 12 game losing streak against the Capitals that has spanned four seasons.